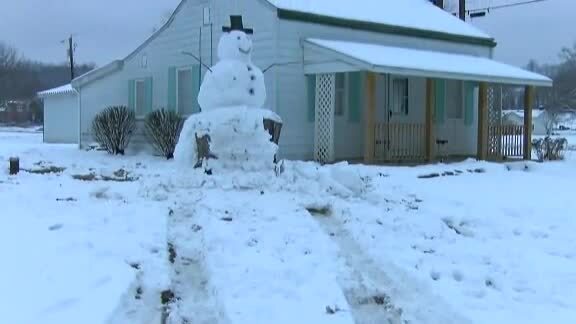 A 9-foot tall snowman in Kentucky dealt vandals a dose of karma on Monday. PETERSBURG, Ky. — (WXIX/CNN) - A 9-foot tall snowman in Kentucky dealt vandals a dose of karma on Monday. In order to build a more structurally sound snowman, Lutz decided to use a large tree stump in their yard as the base for their top hat-topped creation. The trio covered the exposed bark with snow. After returning from work on Monday, Lutz found tire tracks through his yard and leading into the base of the snowman. Lutz believes someone tried to spoil their winter fun by running over the towering snow sculpture but got a rude awakening when they hit the stump.